In between writing articles, and making dinner, we sometimes try to do some creative things. In order to bring you this post...I've lined up homemade challah (from the freezer), slow cooker leg of lamb (freezer lamb to first slow cooker this AM), potatoes and sweet potatoes (second slow cooker), spelt bread for weekend sandwiches (bread machine is going) and salads for all of us. I find if I manage to cook ahead a bit, it leaves me feeling less panicked and less likely to give in to expensive take-out, etc. We're about to enjoy Victoria Day here --May Long Weekend, and that is three days of uninterrupted kid- feeding around here...they sure do eat! Doing all this crazy planning ahead has given me 10 minutes here and there to do some spinning. I found some wool roving (unknown medium wool) leftover from a class I taught a while back. It was a strange small amount, so I decided to use it up. Then I will likely make a chain 3-ply, and knit it into mittens. I foresee a need for all new mittens for next winter; twins are growing fast; must be all that food! In my pre-twin life, I imagined all the creative things I would do with my future kids. I failed to understand how much time goes into just keeping everybody afloat, honestly. However, both my boys really wanted their own hobby horses. I'd read a great book called Rags as a kid, it's by Stella and Linda Allison. I knew we could do this project. Our Professor (Daddy) picked up two broom sticks at the hardware store, and we were off. We had our photo shoot and maiden ride on our new horses (the gray one is a pony, just so you know that, Mommy!) this morning. The boys helped stuff the doubled wool socks (cast-offs with big holes from Daddy) with some wool fleece that was ideal for stuffing. The boys stuffed the broom sticks in. I used duct tape (after bed time) to make sure the fleece did not pop out, nor the heads come off the broom sticks. Each kid picked out the eye colors (note: blue eyes for the blue eyed twin, brown eyes for the brown eyed twin) and mane colors. They cut the mane for me after school one day. I did all the ear attachment, eye embroidery, mane tying, harness, rein and rosette assembly, etc. However, my kids don't yet understand any of that, so they're literally planning their first horse race for the front yard when they come home from school this afternoon. Let the races and adventures begin! Recently, I wrote a piece for the CBC about normalizing breastfeeding. I posted about it here. Then I got approached about writing about how I fed my babies. I was enthusiastic about writing about that struggle... Except? It was an offer for me to do it for free, and potentially provide free marketing to a very big company. I chose to write a different opinion piece, because (surprise!) I think writers (and mothers) should get paid if they choose to write marketing copy. On Mother's Day, what about fair pay for moms? This event offered me the chance to see what I've done, designing-wise, in the past year on Ravelry. Undertow came out a year ago, and I wore it a lot this winter. Soft, stretchy, and definitely warm...mine just got a wash so I could tuck it away. Here's hoping I won't need it til October! Gigadistal is a super bulky, fast knit, great for combining a couple (or three) strands of yarn. 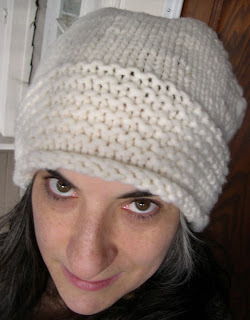 It is a fun accessory for cooler spring/summer/fall days. I've worn my sample quite a bit. 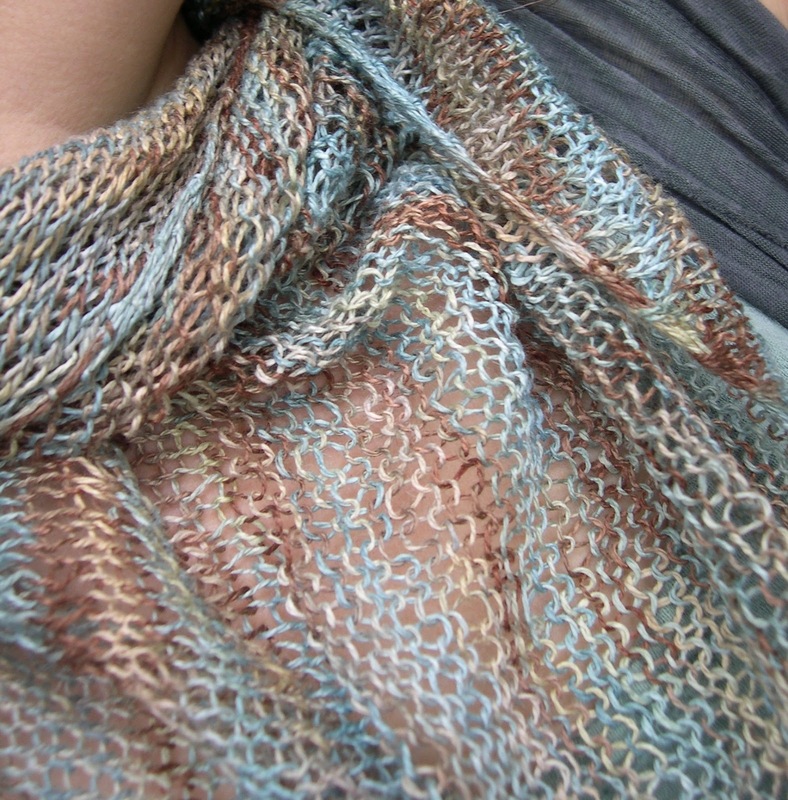 Nanodistal, knit from laceweight linen, is Gigadistal's cousin. Same rough shape and construction--very different effect! I wore this even on the hottest day. It really dresses up loose summer clothing, and I love the drape of linen. 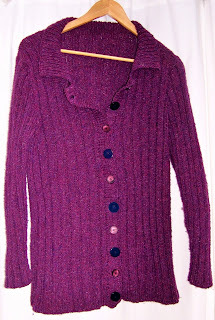 Plum Ribbed Cardigan is a new release of an older favorite--formerly a Knit Picks exclusive. This cardigan took me a while to reknit, but once done? It was so cozy I even wore it to sleep! Last but not least, the Thump Thump Mittens--textured, stranded knitting with a little red, released in time for Valentine's Day, 2017. I hope you find something special to enjoy and get 20% off during this sale. Thanks, as always, for checking out my designs! Here's my latest CBC opinion piece. This went live on their website yesterday-- April 30th. It's on normalizing breastfeeding. It goes beyond making it legal to feed your baby in public...let's make it socially acceptable. PS: I don't ever get to choose the photos or headlines, but I loved these photos. Such strong and positive images of parents taking care of their kids!